A placard at a protest outside a Trump 2020 campaign fundraiser in New York, 2017. Image: PAEarlier this month, the newly elected US congress took office with Democrats now commanding a majority in the House following November’s midterm elections. As images of the latest batch of representatives were beamed across the globe, there was much for the Democrats to celebrate. The 116th Congress is the most diverse on record, and with the Republican congressional caucus still resembling a company boardroom from the 1950s, it is the Democrats who are transforming the composition of US politics. It is a historic moment, but it comes at a time when new fault lines are being drawn, both within the Democratic party, and along established party lines. A new generation of progressive, grassroots Democrats are not only clashing with Republicans, but also figures of the Democratic establishment over policy ideas. Nowhere is this division more apparent than in the realm of healthcare. In the final weeks of 2018, a federal judge in Texas ruled with Republicans to strike down Obamacare in a move President Trump celebrated on Twitter. The ruling opened up a new legal front in a long-standing war between Republicans and Democrats. But it also exposed a rift within the Democratic party, with leaders divided over whether to simply fight for Obamacare, push for a new comprehensive government-backed plan, or develop something in between. The war over healthcare is far from a new development. The Republican and Democrat trenches are well-defined and have been manned since the 1940s. In 1945, Democrat President Harry Truman put America’s health care issue on the national agenda. He was committed to the implementation of a single-payer health insurance plan which would guarantee Americans of all social classes and economic backgrounds access to comprehensive medical cover. For Republicans, his proposal was out of the question. In a speech that resembles something that could have crawled out of the current president’s mouth, Republican senator Robert Taft fumed, “I consider it socialism. It is to my mind the most socialistic measure this Congress has ever had before it”. With the Cold War in its embryonic stages, the label of socialism was a stake through the heart of Truman’s single-payer bill. When Republicans took the House in 1946 the bill was decisively voted down. In 1947, in a statement that seems particularly ironic today, the American Medical Association concluded that Truman’s policy was evidence of “known Communists and fellow travelers within Federal agencies at work diligently with Federal funds in furtherance of the Moscow party line”. Truman’s attempt to reform health care has striking parallels to the current debate around the issue. The Republican lines of attack are unchanged and the funding proposals for Medicare for All are not dissimilar to Truman’s own. Truman’s plan saw medical care financed in a similar fashion to the social security benefits of the day. He proposed a 3% payroll tax, paid half by the employer and half by the employee, which would finance comprehensive medical coverage for everybody in America. The single-payer proposal put forward by Bernie Sanders is no less ambitious. His plan would also see a federally administered single-payer healthcare program which applies to everyone in the country. However, a 3% payroll tax won’t cut it in 2018. To fund a scheme as comprehensive as Bernie’s, federal spending would have to rise by $32.6 trillion over the first ten years. Even with Sanders’ own funding proposals, which include a 7.5% income-based premium paid by employers, a 4% premium paid by households, and an increase in income tax, the government would still be short to the tune of $16 trillion. More than 75% of American voters endorse a Medicare for All policy (far more than the 58% in Truman’s day). But when these voters are staring down the barrel of an 11.5% surtax on payrolls and an income tax hike of up to 9.5%, public appetite decreases (health care reform efforts in Vermont stalled after the full costs became apparent). Bridging the gap between the idealism of Medicare for All and the pragmatism of Medicare for More could unite the party. The issue is that the spiralling costs of medicine in America has put the country in a difficult position. In Austria or Finland, a modest tax increase could bring everyone in the country under the single-payer umbrella. But in the US, a single-payer policy would mean significant tax hikes. If a single-payer policy is unaffordable, what form can a Medicare for All policy take? This is the overriding question that threatens to derail Democrats’ reform efforts and split the party. Medicare for All means different things to different people. In Vermont, it may mean a single-payer system. In Nebraska, it may mean an expansion of Medicare. For voters in Washington D.C., many of whom have existing coverage through their employers, Medicare for All may simply mean more choice. 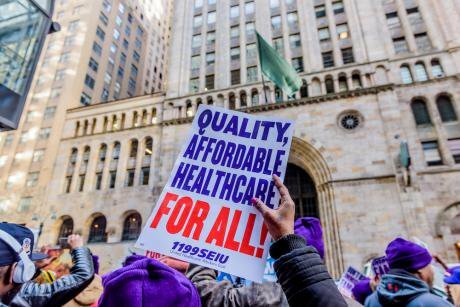 Bridging the gap between the idealism of Medicare for All and the pragmatism of Medicare for More could be exactly what the Democrats need to unite the party, and the country, behind a set of ambitious health care reforms. With Medicare already covering the over-65 demographic, and Medicaid currently offering health coverage to low-income families, at the heart of the health care debate should be the issue of extending coverage to as many people as possible, with only modest increases in health care spending. There are avenues available to expand the coverage already on offer. Firstly, the federal government has to work to bring medical costs down so that they are in line with the rest of the world. In 2016, the US spent more than $10,000 on health care per capita. No other country came close to this figure. There are two standout ways of doing this. Reducing the amount of bureaucracy and paperwork in the medical profession is low-hanging fruit. Just bringing medical bureaucracy down to the same level as Canada would save Americans $160 billion a year. Secondly, the government could regulate drug prices. Japan offers a coherent model on how to do this. The government surveys the drug market and sets a cap on the amount pharmaceutical companies can charge for drugs. Forcing drug companies to secure licenses to sell their drug, managed by a federal drug price-setting board, would ensure pharmaceutical companies toe the line. In 2016, the US spent more than $10,000 on health care per capita. No other country came close to this figure. Once spending per capita has been reduced, the existing Medicare program could be expanded to provide coverage to more of the population. Reducing the age restriction from 65 to 50 would be a start. The government could also use the benefits of the current system to help bring coverage to more people. In states where there are currently two or fewer health insurance providers, an expanded version of Medicare, unrestricted by age, which includes maternity care and pediatric medicine, should be made available. This government-backed health insurance option would promote market competition and lead to a fall in private health insurance premiums. Jacob Hacker, the Director of the Institution for Social and Policy Studies at Yale University, proposes that this government option could be funded by the creation of a public-funded insurance pool. Any employers that do not offer a health insurance program for their employees should have to make a small contribution to this pool (around 6% of the total payroll). The rest of the finances would come from employees paying the premiums. Approaching health care reform in this way would make health care more affordable and bring premiums down while leaving the benefits of the existing system intact. The 56% of Americans enrolled in health insurance programs can keep their plans, but coverage becomes more obtainable for the remaining 44%. Truman was undoubtedly an idealist. He had seen Roosevelt’s decision to omit health care from his ambitious Social Security proposal in the thirties for the very reason that it was too contentious. As a result, Taft and other prominent Republicans were able to appeal to ideology to defeat Truman’s single-payer bill. The Democratic party should learn from this. Sanders’ idealism leaves the Medicare for All concept vulnerable to the same ideological attacks Republicans have mounted for decades. Donald Trump can make the “socialist” infiltration of the American health care system his battle cry and rally his Republican base. But a pragmatic approach which identifies both the benefit and the flaws in the existing system and attempts to preserve what is working and replace what isn’t; that would force Trump and the Republicans to engage in political debate. Something they are far less comfortable with.